This is the ultimate guide to the best Bitcoin loan platforms. So, if you want to lend Bitcoin or borrow Bitcoin then this guide is for you. Many people chose to take cryptocurrency loans because they need cash and don’t want to sell their crypto. There are TONS of lending site scams out there. If you want to stay on the safe side and get a cheap and easy Bitcoin loan, then read on. * LTV stands for “Loan To Value”. Example: Lending $1,000 with a collateral of $500 would be an LTV of 50%. ** APR stands for “Annual Percentage Rate”, which is the interest rate for a whole year. 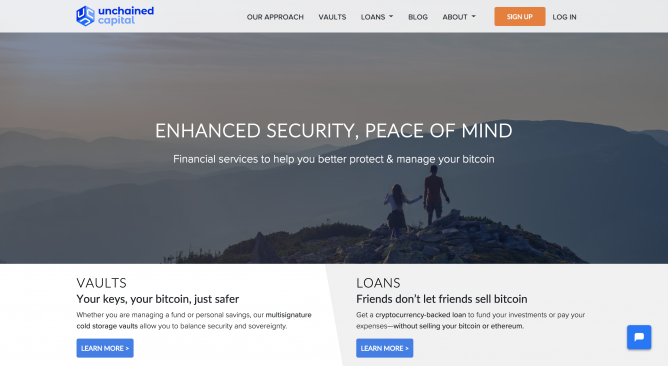 Launched in 2017, New York-based BlockFi has quickly risen to prominence in the Bitcoin loan industry due to its great service and open support from Anthony Pompliano. Currently, BlockFi offers USD loans which are backed by one of three cryptocurrencies: Bitcoin (BTC), Ethereum (ETH) or Litecoin (LTC). This means that to take out a USD loan at BlockFi, you must provide collateral in the form of BTC, ETH or LTC. On BlockFi, loans will be given at a maximum loan to value ratio (LTV) of 50%, while a minimum of 4.5% interest per year, plus a 2% origination fee is applied. 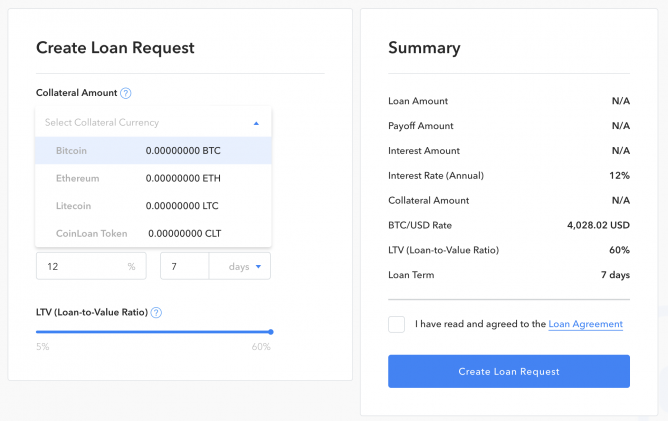 In order to make their loan service available to as many people as possible, BlockFi has made their loan application process extremely simple. To get started, you simply select which cryptocurrency you will be providing as collateral, enter the amount you’re looking to borrow and then provide some details about yourself and the purpose of the loan. Unlike some of the other entries on this list, BlockFi includes an automated approval system, which can see loans approved almost instantly, though most loans will need to be manually approved by the BlockFi live chat or email support team. 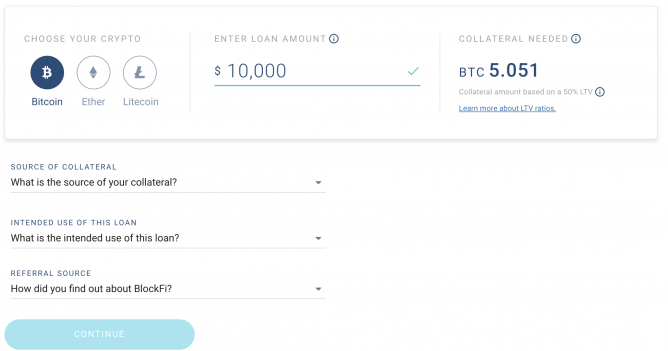 BlockFi is remarkably open about their entire loan procedure, and even include a handy calculator on the website so you can estimate several parameters relating to the loan, including collateral requirements, total interest, and more. On BlockFi, you can also create what is known as an “interest account,” which allows you to earn 6% annual interest on your Bitcoin (BTC) and Ethereum (ETH) holdings. That being said, both have a somewhat substantial minimum deposit of 1 BTC and 25 ETH respectively. When it comes to margin call terms, BlockFi sits somewhere in the middle of the spectrum in terms of leniency, requiring that borrowers pay down the loan within 72 hours if the LTV exceeds 70%. If this exceeds 80%, BlockFi will automatically sell a portion of the collateral to keep the LTV at 70% or less. 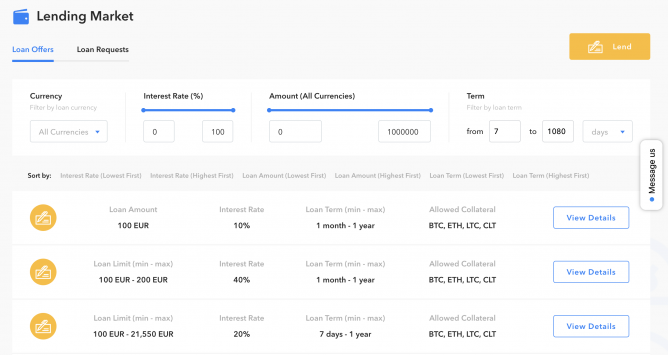 Based in Estonia, CoinLoan brings to the table a peer-to-peer lending platform that enables long-term holders to quickly receive a high-LTV loan, while providing those with excess fiat a healthy return when they provide collateral. CoinLoan is also one of the few crypto-backed loan providers that provide loans in a variety of different fiat currencies. 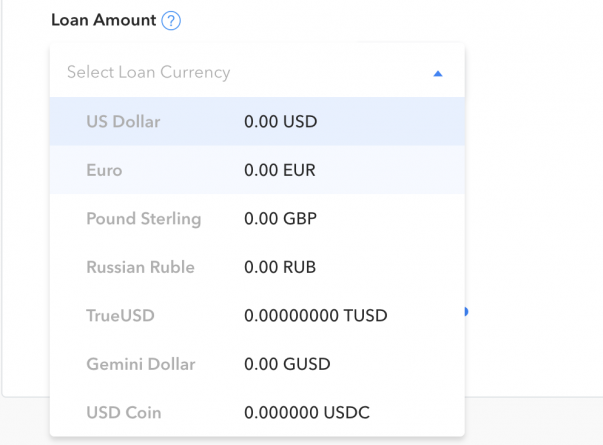 The platform allows borrowers to choose from USD, EUR, GBP and RUB, while also providing the option to receive a loan in several stablecoins. In terms of collateral, lenders on the platform set which types of cryptocurrencies they accept as collateral, with Bitcoin (BTC), Ethereum (ETH) and Litecoin (LTC) available as options. Users can also opt to accept the platform’s native ‘CoinLoan token (CLT)’, though these will only be provided up to a maximum of 20% LTV due to the lower liquidity of the token. Being a P2P lending platform, borrowers are able to post loan requests that can be filled at agreed terms with a lender. Similarly, lenders can create their own loan offer, specifying the interest rate, accepted collateral and maximum loan amounts, which can then be quickly accepted by a borrower. On CoinLoan, the loan interest rates can vary, though between 7-15% APR appears to be the norm. Borrowers must also pay a borrowing fee, which can be between 1-3% of the principal amount, depending on the loan duration — this can also be paid in CLT, and usually works out much cheaper this way. Almost all loans on CoinLoan are provided at 60% of the collateral value, which is currently one of the highest rates in the industry. Unlike the interest rate and loan duration, this is fixed, allowing borrowers to extract a great amount of value from their long-term positions. Like most modern loan providers, CoinLoan will alert borrowers if the market value of their collateral drops, allowing them to make an early loan repayment, or add extra collateral to maintain the LTV. Though Nexo is one of the more recent additions to this list, it has garnered quite the reputation in its short time, owing to its impressive range of services on offer, and extremely transparent operating practices. Nexo stands apart from other wallets and loan providers by providing insurance over your funds through its partnership with BitGo and Lloyd’s of London, ensuring that your money remains protected even if Nexo is breached. 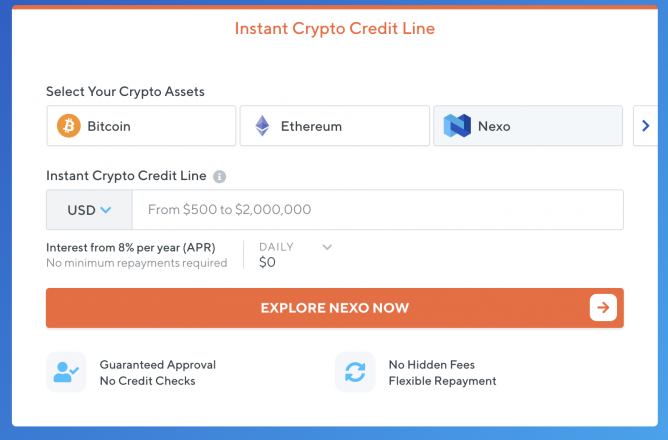 Unlike other crypto loan companies, Nexo offers what is known as a credit line — similar to using a credit card. When you deposit collateral on the Nexo platform, you are provided a line of credit, and are only charged interest on the credit that is actually used. Currently, interest is charged at 16% APR, but can be reduced to 8% APR using NEXO collateral. 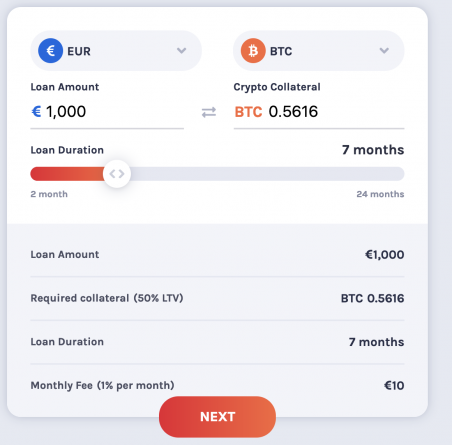 The Nexo loan process does not require any credit checks, and borrowers can get an easy Bitcoin loan without verification thanks to its automated approval process. Once approved, the funds are made available instantly within your account, but can take 1-5 days for withdrawal depending on the option used. Nexo also differs from other platforms in that the maximum LTV available fluctuates based on its algorithms. However, they are approximately maintained at around 50% for Bitcoin (BTC) and Ethereum (ETH), 90% for True USD (TUSD), 30% for Binance Coin (BNB) and 15% For NEXO. Partial loan repayment will be automatically made if the collateral drops too far out of the LTV zone, though the customer will be warned in advance if there is a risk of this. Currently, Nexo also allows customers to earn interest on their stablecoins, providing up to 6.5% interest per year with no minimum investment amount or withdrawal restrictions. Nexo is also planning to offer the same service for Bitcoin (BTC), Ethereum (ETH) and Ripple (XRP) in the near future. 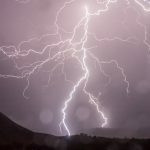 This service is free of charge and is backed by Nexo’s $100 million crypto custodian insurance policy. Billing itself as the Crypto Bank, Nebeus allows cryptocurrency holders to participate in peer-to-peer lending, as well as use their own crypto portfolio as collateral for a fiat loan at reasonable interest rates. Like the great majority crypto-backed loan platforms, Nebeus doesn’t require a credit check, and doesn’t report your loan status to credit agencies, ensuring even those with bad credit can still be considered for a loan. Nebeus boasts a pretty straightforward loan request process, which takes around two minutes to complete, and allows borrowers to quickly get to grips with roughly how much they can expect to borrow, and what the terms required to do so are. At Nebeus, loans are can be provided in three different fiat currencies: USD, EUR, and GBP, whereas Bitcoin (BTC) and Ethereum (ETH) are accepted as collateral. Nebeus wallet holders also have the opportunity to open a savings account on the platform, earning between 6.25% and 8.25% interest on their cryptocurrency holdings for helping to fund other people’s loans. Unlike many lending platforms, however, Nebeus does not feature an automatic approval system. Loan approval and full details are instead sent via email within 24 hours — this can make Nebeus less attractive to those looking to arrange and receive a loan urgently. When it comes to the LTV, Nebeus is certainly not the highest on the market at 56%, but it does somewhat make up for this by offering a fair interest rate starting as low as 5% APR, with both short-term and long-term loans available. According to Unchained Capital, friends don’t let friends sell bitcoin. Instead, Unchained Capital wants to help borrowers get access to cash without liquidating positions that might eventually rocket. If you’re somebody with a significant cryptocurrency portfolio looking for a loan provider that can meet your needs, then Unchained Capital might be just what you are looking for, since they can provide up to $1 million to eligible borrowers. Unchained Capital also stand out within the Bitcoin loan industry since their wallets are compatible with cryptocurrency hardware wallets such as the Trezor and Ledger, allowing users to control their own private keys while provide excellent security. Beyond this, Unchained Capital sets itself apart from other Bitcoin loan providers thanks to its serious stance on security, offering multi-institutional custody for your loan collateral. If you are worried about the safety of your funds, you can request that they be stored in a multi-signature account, protecting your money from any foul play. Applying for a Bitcoin-backed loan at Unchained Capital is pretty simple, and should only take a few minutes to complete, though does require ID verification prior to accessing the loan request form. Currently, just Bitcoin (BTC) and Ethereum (ETH) are accepted as collateral. Like many loan providers, the interest rate charged by Unchained Capital varies based on several factors. Shorter loans benefit from lower interest rates, starting at 7.25% APR on 3-month loans, and increasing to as much as 13% APR on loans exceeding 3 years. Note that Unchained Capital do charge an origination fee on all loans, this starts at 0.5% for 3-6 month loans, but increases to 1% on longer loans. Unchained Capital offer loans at up to 50% LTV, and provide an interest fee reduction of 0.5% for loans under 35% LTV. Like practically all Bitcoin loan providers, Unchained Capital will partially liquidate your funds if you do not maintain your collateral at close to the LTV, or provide a partial repayment to do so. In addition to this, it is one of the only loan providers to actually reimburse your collateral if it massively spikes in price, though this is upon request. As a regulated financial institution, BitBond is among the most trustworthy and well-reputed Bitcoin loan providers currently in operation, having served over 150,000 borrowers worldwide and being in operation since 2013. BitBond is one of the select few Bitcoin loan providers that offers business financing, allowing businesses worldwide to get a Bitcoin loan fast, without having to go through extensive audit procedures first, and without needing to provide collateral. Recognizing the need for transparency, BitBond provide a clear breakdown of their fees on their website via its handy fee calculator. Interest rates start from 1% per month, plus an additional 2-3% origination fee. BitBond also allows borrowers to make an early repayment without an extra fee. Though BitBond doesn’t require a credit score, it does check your credit-worthiness by requiring that you associate your business accounts with its platform. This will give BitBond the opportunity to check your cash flow and ascertain how much funding your company is eligible for. During the application process, you will be asked to provide your personal information in addition to details about your business finances, such as your 12 month turnover and whether there are any outstanding debts. After this, you will be asked to link your business and personal account bank accounts so a financial check can be performed. In terms of approval times, certain customers with an excellent track record can have their loan approved instantly, whereas for new borrowers and those without significant financial security, loans can take as long as 14 days to be approved. 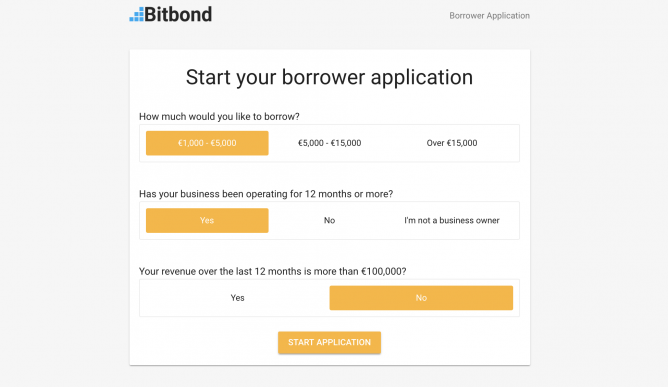 Since BitBond primarily focuses on business loans, it has different requirements from many of the other providers on this list. However, this is also what sets it apart from the crowd, since it does not require borrowers to provide any collateral, which also means both LTV restrictions and margin call problems are completely avoided. As an Europe-centric lending company, HODL Finance only offers its services to customers in 33 European countries. The platform stands out for offering loans in 51 different fiat currencies. To date, HODL Finance have filled more than $22 million in loan requests, making them a serious force in the crypto loan industry. Using HODL Finance couldn’t be any simpler. After registering for an account all users are provided collateral wallets for Ethereum (ETH), Bitcoin (BTC) and Ripple (XRP), which can be funded as necessary. Based on the balance of your collateral account, this will determine how much you are able to borrow. Applying for the loan is about as easy as it gets, simply requiring you to enter how much you’re looking to borrow, select your loan duration, deposit your collateral (if you haven’t done so already) and then provide your SEPA or SWIFT details to receive your loan. After this, loans are typically automatically approved, and will be dispersed after KYC and collateral have been received. HODL Finance also keeps it simple when it comes to LTV and interest rate, keeping the LTV fixed at 50%, whereas the interest rate is 1% per month. At the moment loans are available for between 2 months and 2 years. That being said, HODL Finance cannot be considered a large loan provider, since the maximum loan amount is set at $25,000. However, HODL Finance is one of the few Bitcoin loan providers to facilitate micro-loans, providing loans as small as $50 — perfect if you just need some quick cash. Loans from HODL Finance are typically approved the same working day, but the time it takes to actually receive your funds can vary depending on the transfer method, with EU bank transfers taking 1 working day, whereas international payments could take up to a week. What is a Bitcoin loan? When you see the words ‘Bitcoin loan’, you might first think that the loan itself will be paid out in Bitcoin. However, this isn’t always the case, as often the term Bitcoin loan is used interchangeably with Bitcoin-backed loan, meaning you use your Bitcoin as collateral to receive a loan in another currency. Bitcoin loans were initially introduced as a way for cryptocurrency holders to get quick access to capital without having to sell their cryptocurrency to do so. However, since then, Bitcoin loans have become more than just a source of liquidity, and have become an investment tool in-and-of itself, as people leverage their current portfolio to enter new positions with their newly acquired finance. Bitcoin loans are mostly considered ‘secured’ loans, which means one of the prerequisites for loan approval is sufficient collateral. Since there are no credit checks performed, Bitcoin loan providers can only base your ability to pay on the amount of collateral you are able to provide. Other than that, Bitcoin loans work much like a standard loan you might receive from a bank, with there being an application process, and review before approval. After approval, you will receive your loan by the chosen payment method — usually by bank or wire transfer. Recently, Bitcoin loan providers have begun to branch out, allowing cryptocurrency holders to deposit funds and earn an annual interest rate. Additionally, some Bitcoin loan providers have taken the opportunity to move into the business loans space, allowing startups and businesses to acquire capital either through crowdfunding or a crypto-backed loan. Why get a Bitcoin loan? For the most part, people taking out a Bitcoin loan will be looking for emergency money, but not at the cost of selling out their long-term cryptocurrency investments. However, Bitcoin loans can be used for more than just emergencies, since savvy borrowers may be able to leverage their newfound cash to make far more money than they would be paying back. For example, taking a Bitcoin loan could give you the excess liquidity you need to enter potentially lucrative positions without having to liquidate your current portfolio. As many traders are well aware, cryptocurrency markets often spike by upwards of 10% in a month, making potentially well over 100% gains in a year possible. Comparing this to the typical interest rate of 10-20% per year, it is easy to see how taking out a Bitcoin loan could be profitable for an accomplished trader. Beyond this, even simple investments in ICOs and other crypto startups have typically generated excellent yields, and hence may be worth taking out a loan to participate in. Similarly, if you live in a country where converting cryptocurrency directly into fiat is a taxable event, getting a Bitcoin loan could prove to be a clever way to avoid being taxed, allowing you to benefit from the value locked up in your portfolio, while delaying, or completely avoiding the tax that typically comes with liquidating your assets. What are the benefits of a Bitcoin loan? Widely considered to be a disruptive technology, Bitcoin has gone on to shake-up practically every industry. Fortunately, the online loan industry was one of the earliest to be disrupted by Bitcoin, with Bitcoin and other cryptocurrencies enabling a new and improved way of handling loans. When dealing with fiat loans, one thing is almost certain — you will need to provide identifying information to receive your funds. In contrast, cryptocurrency holders now have the opportunity to opt for an anonymous Bitcoin loan, with several loans providers even paying out loans in privacy coins such as Monero (XMR), helping borrowers avoid the risks of identity theft that comes with KYC. Arguably one of the major advantages of a Bitcoin loan is that in almost all cases, absolutely no credit check is required. Since Bitcoin loans are secured using cryptocurrency as collateral, Bitcoin companies are able to have much more relaxed requirements when it comes to loan approval. Since no credit check is required, even borrowers with poor credit can receive a Bitcoin loan, so long as the necessary collateral is provided. If you are a long-term Bitcoin holder, then you have probably considered selling all or part of your portfolio to get access to the value locked up within it. Though, you probably also don’t want to close these long-term positions, since many would argue that cryptocurrencies are likely to experience huge growth in the future. Because of this, crypto loans represent an excellent opportunity for long-term holders, allowing them to borrow money, while maintaining the long-term potential of their investments. That’s like having your cake, and eating it too! What are the risks of a Bitcoin loan? Though Bitcoin loans benefit from being easily accessible and are often processed extremely quickly, they do come with their fair of share of risks, which may make them unsuitable for some people or under certain conditions. Since cryptocurrencies are particularly volatile, most Bitcoin loan companies will only provide loans at a low LTV, typically in the range of 20-70%. Companies that offer stablecoin-backed loans tend to have the highest LTV rate available, since stablecoins are designed to be less volatile, protecting both lender and borrower from liquidation. Although Bitcoin loans provide the opportunity to essentially spend money that is locked up in your cryptocurrency portfolio, this can sometimes do more harm than good, since you may not be able to access your collateral during a significant price swing that you could have otherwise benefitted from. Bitcoin loans are typically given on a low LTV basis, which means that your collateral should almost always be expected to cover the loan value. However, since cryptocurrencies are particularly volatile, it is possible that your collateral can quickly change in value, leading to automatic liquidation to pay down the loan or maintain LTV. Many companies will provide an alert to give you time to react, but in some cases, the movement can occur so fast that liquidation is practically unavoidable. Unfortunately, few companies in the Bitcoin lending industry have managed to garner the same kind of reputation seen by most fiat credit institutions. 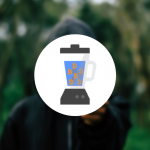 Part of this is a result of the largely unregulated early days of cryptocurrency, which meant several unscrupulous organizations ended up scamming. Since then, Bitcoin loan companies have come a long way, but there are still fraudulent platforms cropping up every now and then. While getting a Bitcoin loan might be convenient, this convenience often comes with a higher interest rate than you might otherwise be accustomed to. In general, the great majority of Bitcoin loans are provided at between 5-20% APR, with this generally being lower for short-term loans. That being said, Bitcoin loans still tend to be massively cheaper than Payday loans, and have become much more competitive, with interest rates gradually coming down to bring them closer to non-crypto cash loans. How can I get a Bitcoin loan? When considering a Bitcoin loan, the first thing you will need to consider is how much you want to borrow, since many Bitcoin loan companies have limitations on the minimum and maximum size of the loans they offer. Once this is determined, you will then needed to narrow down your options based on the types of collateral accepted by the loan provider. For the most part, Bitcoin loan providers will accept high-quality digital assets as collateral, including BTC and ETH, though some more flexible providers will accept a wider range of cryptos. Bitcoin loan providers will only provide a fractional LTV, which means you will need to offer up collateral worth some multiple of the loan amount. As an example, if you are taking out a $10,000 loan at a provider offering loans at a maximum of 50% LTV, then you will need to provide at least $20,000 worth of collateral. Unfortunately, if you don’t have collateral, it is very unlikely you’ll be approved for a Bitcoin loan. Once you have your lender, loan amount and collateral prepared, you will then need to begin the loan application process, during which you will select the loan amount and duration, and provide details on the collateral you can offer. Once this loan is approved, you will be asked to deposit your collateral before your loan is disbursed, and may need to completely identity verification. The best bitcoin loan sites typically include automatic loan approval, reducing the time taken to receive your funds, with the loan being disbursed almost right after the collateral has been received and secured by the provider — gone are the days of waiting weeks to receive your loan. What to watch out for when getting a Bitcoin loan? Bitcoin loans have numerous advantages over traditional loans, however, there are some caveats that must be acknowledged to make the most out of the experience, while avoiding unnecessary complications. Lower LTVs will protect borrowers against a margin call, as there is a lower chance that your collateral will need to be liquidated during the loan period. Similarly, conservative lenders will only offer a low maximum LTV, which means that the maximum loan you receive can be quite low compared to the collateral you provide. Because of this, it’s important to thoroughly check the margin call terms and conditions for each loan provider you are considering. Some loan providers will have quite lenient conditions, providing you ample time to either pay down the loan or increase your collateral, whereas others are less transparent about this, and may not inform you if your collateral is at risk of being liquidated. When selecting a loan, arguably the most important factor is the interest rate. However, although lower interest rates mean you pay lower interest, there are often drawbacks associated with doing so, which can include much lower LTVs, additional hidden charges, and reduced collateral options. Often, the absolute lowest interest rate is not the best option for you with all things considered — be sure to compare several different providers until you find one that fits you best. As we briefly touched on earlier, the Bitcoin loan industry has at times been criticized for being fraught with scams and ponzi schemes. Unfortunately, there is some truth to this, since many of the older Bitcoin loan platforms have turned out to be a scam, with BitConnect being the most prominent example of this. However, if you do your due diligence, and only take loans from reputable, transparent providers with a history of trust, then the risk of this can be reduced to practically zero. Which Bitcoin lending site is best for me?